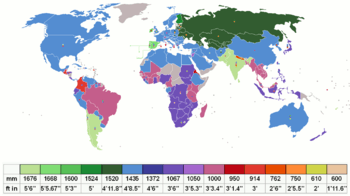 Iberian gauge (Spanish: ancho ibérico, trocha ibérica, Portuguese: bitola ibérica) is the name given to the track gauge most extensively used by the railways of Spain and Portugal: 1,668 mm (5 ft 5 21⁄32 in). This is the second-widest gauge in regular use anywhere in the world. As finally established in 1955, the Iberian gauge is a compromise between the similar, but slightly different, gauges adopted as respective national standards in Spain and Portugal in the mid-19th century. The main railway networks of Spain were initially constructed to a 1,672 mm (5 ft 5 13⁄16 in) gauge of six Castilian feet. Those of Portugal were instead built to a 1,435 mm (4 ft 8 1⁄2 in) and later railways to a 1,664 mm (5 ft 5 1⁄2 in) gauge of five Portuguese feet – close enough to allow interoperability with Spanish railways. Since the beginning of the 1990s new high-speed passenger lines in Spain have been built to the international standard gauge of 1,435 mm (4 ft 8 1⁄2 in), to allow these lines to link to the European high-speed network. Although the 22 km from Tardienta to Huesca (part of a branch from the Madrid to Barcelona high-speed line) has been reconstructed as mixed Iberic and standard gauge, in general the interface between the two gauges in Spain is dealt with by means of gauge-changing installations, which can adjust the gauge of appropriately designed wheelsets on the move. Plans exist to convert more of the Iberian-gauge network in Spain and Portugal to standard gauge, an indication of which is the use, on several stretches of recently relaid broad-gauge track, of concrete sleepers pre-drilled with additional bolt holes allowing for repositioning of one rail to adjust the track to standard gauge (or to dual gauge) or the narrowing of the gauge by moving both rails closer together maintaining the perfect alignment of the loading gauge. A commonly cited reason for the adoption of this gauge, broader than that which became the international standard, is that it was intended to hinder any use of the railroad in any of the French invasion attempts. This is possible, but the 19 January 1845 governmental decree does not state any reason, simply the gauge itself. It is known that the government entrusted such decisions to a committee, whose main work was done by civil engineers Juan Subercase and Calixto de Santa Cruz: both good civil engineers but with little experience in railroads. Their judgement, made because of their profession and lack of experience in railroads, was that since the Spanish landscape was more mountainous than that of England and France, a wider gauge would make more powerful locomotives possible, with larger boilers and, more importantly, larger fireboxes. This was obviously a miscalculation; in other areas of Spain, narrower gauges were used in the most mountainous areas, since Iberian gauge civil engineering works would have been more expensive. One example of this is the 1,000 mm (3 ft 3 3⁄8 in) gauge FEVE. Indian gauge (1,676 mm or 5 ft 6 in) is closely similar, with only 8mm difference, and allow compatibility with the rolling stock. For example, Chile and Argentina buy second hand Spanish/Portugal Iberian-gauge rolling stock. Spain Adjusted from the original 1,672 mm (5 ft 5 13⁄16 in) in the 19th century. Adif-managed national railway network (except new high-speed railway lines). Although Lleida–La Pobla de Segur Line is both managed and operated by Ferrocarrils de la Generalitat de Catalunya (FGC), it was formerly part of the national railway network and was constructed to the 1,668 mm (5 ft 5 21⁄32 in) gauge. Barcelona Metro line 1 still uses the former 1,672 mm (5 ft 5 13⁄16 in) gauge. ↑ The gauge of the early Portuguese lines built to the "English" (later: international) gauge was subsequently altered to Iberian to ensure interoperability – Assim, em 20 de Junho de 1860, funda a Companhia Real dos Caminhos de Ferro Portugueses que se propõe explorar as Linhas do Norte e do Leste e as linhas de que posteriormente obtivesse concessão. Thus, on June 20, 1860, founded the Society of Real Caminhos de Ferro Portugueses it proposes to exploit the lines of North and the East and the lines that subsequently obtain concession. De imediato a Companhia Real muda a bitola (1,44 metros) da linha já construída entre Lisboa e Asseca (68 Km. ), passando-a para a bitola ibérica, com 1,67 metros, sem haver qualquer interrupção no serviço ferroviário. From immediate changes to the Company Real gauge (1.44 m) of the line already built between Lisbon and of Asseca (68 km), passing it to gauge the Iberian, with 1.67 metres, without any interruption in rail service. Archived March 27, 2008, at the Wayback Machine. ↑ "El ancho de vía del tren español" (in Spanish). flexarorion. Retrieved 26 April 2011. ↑ Churcher, Colin. "Broad Gauge Railway Relics in the Açores". Retrieved May 3, 2011. ... the broad gauge of 7 feet 0¼ inches ... was that chosen by Isambard kingdom Brunel for the Great Western Railway.